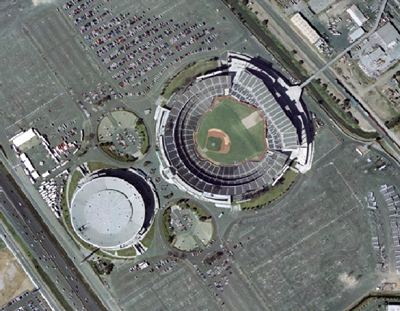 The Coliseum Area Specific Plan ("Coliseum City") seeks to transform the underutilized land around the Oakland-Alameda County Coliseum and Arena into a world-class sports, entertainment and science & technology district that boasts a dynamic and active urban setting with retail, entertainment, arts, culture, live and work uses. The area is located in the center of the Bay Area and has many highly sought development assets, including freeway connectivity, immediate BART access at the Coliseum Station, the Oakland International Airport, waterfront views and development opportunities. On April 21, 2015, the City Council took a second vote and adopted the new zoning regulations for the Coliseum Area. The Council adopted new zones --“District Coliseum 1-6”, and mapped these zones throughout the 800-acre Plan Area. The new zones permit the vision of the Coliseum Area Plan to be built: new sports venues, new housing, new office space, and new open space at the Coliseum and environs. The Council selected a zoning map that enables the goals and future development envisioned in the Plan, while preserving the Oakland Airport Business Park for industrial and commercial office uses. Previously, on March 31, 2015, after a public hearing, the Oakland City Council adopted the Specific Plan, certified the EIR, and adopted the related actions of general plan map and text changes. Click here to download a copy of the Final Specific Plan. By ordinance, the new zones will be effective on May 21, 2015. Click here to see the full text of the Planning Code with the new Coliseum District zones. See below for the new zoning map, and all previous meetings and materials. Click here to download a copy of the zoning map. A summary of the Specific Plan build-out includes up to three new sports venues totaling nearly 1.7 million square feet of building space or 131,000 seats; just over 14 million square feet of Science & Technology, office, light industrial, logistics and retail space; and over 5,000 residential units. This represents an increase of approximately 8.3 million square feet of new building space within the Plan area. The proposed Specific Plan build-out also includes up to approximately 15,000 parking spaces on the Coliseum site. There are proposed to be nearly 39 acres of new, publically-accessible open space, creek and wetland improvements, and restored open space on the Bay waterfront. Click here to read the project summary. On April 21, 2015, the City Council took a second vote to adopt the new zoning regulations for the Coliseum Area. The Council adopted new zones --“District Coliseum zones 1-6”, and mapped five of these zones throughout the 800 acre Plan Area. 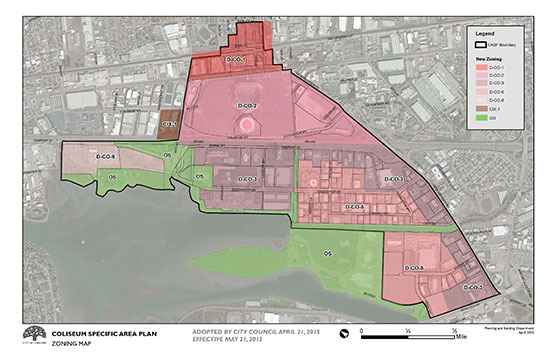 The new zones permit the vision of the Coliseum Area Plan to be built: new sports venues, new housing, new office space, and new open space at the Coliseum and environs. The Council selected a zoning map that enables the goals and future development envisioned in the Plan, while preserving the Oakland Airport Business Park for industrial and commercial office uses. Previously, March 31, 2015, after a public hearing, the Oakland City Council adopted the Specific Plan, certified the EIR, and adopted the related actions of general plan map and text changes. The City Council's Community and Economic Development (CED) Committee unanimously forwarded the Specific Plan, EIR and related actions to the full Council, for a public hearing on March 31, 2015. An alternative zoning map was also proposed for consideration by the Council. The City Planning Commission held public hearings on the Plan and EIR and related actions in February and March, 2015; on March 11th, the Commission recommended approval by the City Council. The City Council starts public hearings on March 24th. See below for dates and times of public hearings. The City released the Final Environmental Impact Report on February 20, 2015. The Final EIR may be reviewed at "Plans and Documents" section, below. The City released the final draft Coliseum Area Specific Plan on January 30, 2015, to be considered by the public and the Oakland Planning Commission at public hearings on February 4 and 18th. Public hearings will be held before advisory committees in February and March. The Oakland City Council is expected to consider the Plan, the proposed zoning, and the EIR in March and April. See the public hearings schedule for confirmed dates and times. 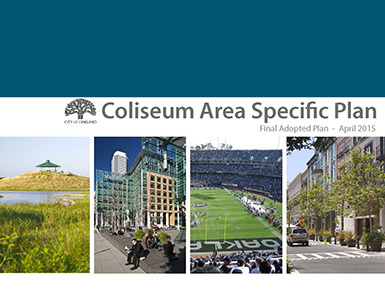 The Notice of Availability (NOA) was released for the Draft Environmental Impact Report (DEIR) for the Coliseum Area Specific Plan on Friday, August 22, 2014. Review/Comment period: August 22, 2014 through October 17, 2014 (the comment period was extended from October 6th). The Draft EIR and the Draft EIR Notice of Availability/ Release may be reviewed at "Plans and Documents" section below, or the City’s Current Environmental Review Documents webpage. Public workshops about the Plan were held in April, May, September, October, December of 2014, and January and February of 2015. The City issued the Notice of Preparation of an Environmental Impact Report on April 19, 2013, starting the public review process. April 21, 2015, 6:30 p.m. City Council public meeting City Council Chambers Public hearing to adopt the new District Coliseum zoning codes, and new zoning map. Click here to be redirected to the City Clerk's website, to read the report, attachments and ordinance. March 31, 2015 City Council public hearing City Council Chambers Click here to be redirected to the City Clerk's website, to read the report, attachments, resolution and ordinance. Click here to see the staff presentation. Click here to see the adopted General Plan Map; click here to see the table of General Plan changes. March 24, 2015 City Council Community and Economic Development Committee City Council Chambers Click here to be redirected to the City Clerk's website, to read the report, attachments, resolution and ordinance. Click here to see the staff presentation. March 18, 2015 Alameda County Airport Land Use Commission 224 W. Winton Avenue Hayward, CA Click here to read the adopted Resolution. Click here to be redirected to the Planning Commission page to read the Staff Report and Attachments (see "March 4th" Agenda item #3). February 23, 2015 Oakland Landmarks Preservation Advisory Board City Council Chambers, Oakland City Hall The LPAB conducted a public hearing to provide cultural-resource related comments on the Final Draft Coliseum Area Specific Plan, proposed zoning and general plan amendments. To read the staff report, click here. February 9, 2015 Oakland Landmarks Preservation Advisory Board Hearing Room 1, Oakland City Hall The LPAB will conduct a public hearing to provide cultural-resource related comments on the Final Draft Coliseum Area Specific Plan, proposed zoning and general plan amendments. No action will be taken at this meeting. Click here for the staff report. Click here for the attachments (24 mb). February 4, 2015, 6:00 p.m. Oakland Planning Commission City Council Chambers, Oakland City Hall The Planning Commission will conduct a public meeting to consider recommending to the City Council adoption of the Final Draft Coliseum Area Specific Plan, and the proposed new Planning Code (text and maps) and General Plan amendments. Click here for the staff report and attachments. Staff Report, Attachment A (proposed General Plan Amendments), Attachment B (proposed Zoning map changes), Attachment C (proposed new zoning text), and Attachment D (Plan sub-area map). Final Adopted Plan, adopted by Council April 21, 2015. Click here to download the plan (27MB). Final Draft for Public Review, released January 30, 2015. Click here to download the plan (27MB). Click here to see the Oakland Planning Code amendments (zoning changes) for new "District Coliseum" (D-CO) zones. The Coliseum zones go into effect on May 21, 2015. Click here to see the zoning map adopted by Council on April 21, 2015. Click here to read the identification key to the map. The Coliseum zoning map goes into effect on May 21, 2015. Click here to see the new General Plan map, adopted by Council on March 31, 2015. Click here to read the identification key to the map. Click here to see a map of land owned by Oakland/Alameda County, City of Oakland, and other public entities. Click here to see a map of land owned by Oakland/Alameda County, City of Oakland, and other public entities, with new Coliseum Zones and Port of Oakland jurisdiction. Click here to read the Final Environmental Impact Report (FEIR) and response to comments, released on February 20, 2015. Draft Environmental Impact Report (DEIR) released August 22, 2014 and Notice of Availability (NOA) for the Draft Environmental Impact Report released August 18, 2014. Coliseum City Master Plan -- Click here to view part 1 and part 2 of the Coliseum City Master Plan (July 2013), prepared by JRDV Urban International, for the City of Oakland. Please click here to read a Plan timeline and answers to Frequently Asked Questions.